With a wide range of colors and dimming capabilities, Kasa Smart's multicolor light bulb offers endless lighting possibilities. You can choose a light for everything from a dinner party to a late-night study session. Kasa Smart's multicolor light bulb connects to your home's secure Wi-Fi network. No need for a hub or extra equipment. Control your smart light bulb from anywhere with your smartphone using the free Kasa Smart app. 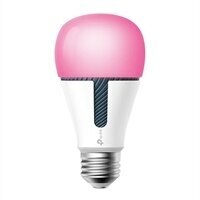 Dim, turn on or off or change the colors of your light bulb remotely at your fingertips.